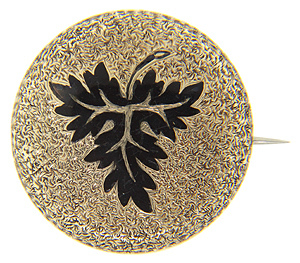 This antique, 14K rose gold Victorian brooch has a black enamel leaf in the center with hand chasing surrounding the leaf. The pin is the perfect accessory to any outfit. Circa: 1870. It measures 1” in diameter.